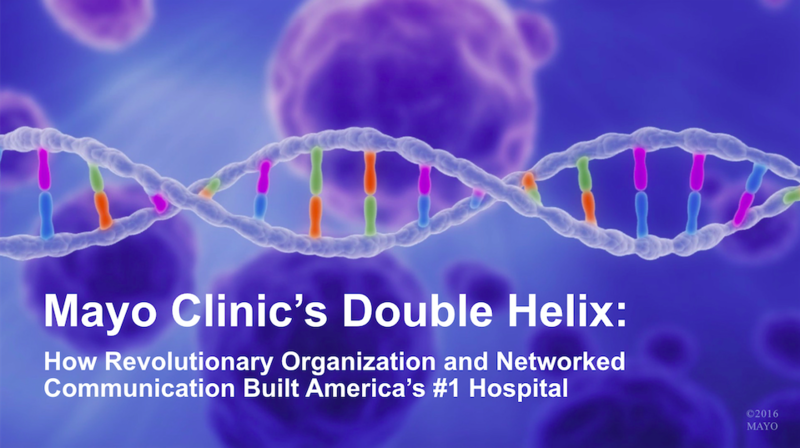 In the first half of this series, we examined the organizational DNA of Mayo Clinic as the combination of fundamental "base pairs" — Teamwork, Altruism, Progress and Stewardship — that were characteristic of our founders. We've seen how these base pairs were expressed in Franciscan values and linked by two major strands: a revolutionary patient-centered organization and networked communication. media stories that spread news about Mayo Clinic to mass audiences. In the rest of this series, we'll make the case that Mayo Clinic's exploration, adoption, embrace, and eventual leadership in social media was a logical expression of Mayo Clinic's DNA, adapting the organization to a changing communications environment. In the 1990s Mayo leaders began to commission consumer and patient research that helped them understand the reasons behind preference for Mayo Clinic. Word-of-mouth was the top factor, while stories about Mayo Clinic in news media also were important. That's why Mayo developed a national media relations plan in the late 1990s, hiring several media relations professionals to facilitate more of those news stories. I was one of them, starting at Mayo Clinic in April 2000. That same month, Mayo began a syndicated television program that was extremely important in our social media history. Mayo's Public Affairs leaders recognized the changing economics of TV news and saw an opportunity. Faced with declining and fragmented audiences, many local TV stations were reducing staff and couldn't afford dedicated health reporters. Yet their viewers were still interested in health and medical news. Medical Edge, a weekly 90-second news package with patient-focused stories, offered on a market-exclusive basis to stations in the U.S. and Canada, was Mayo's answer. Medical Edge TV was the foundation not only for Mayo's YouTube channel, but also for other syndicated media initiatives that were important in Mayo's journey into social media. Next time we'll review the role of those other initiatives and Mayo's first foray into "New" media. 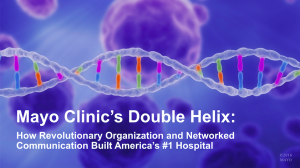 In the first half of this series, we examined the organizational DNA of Mayo Clinic as the combination of fundamental "base pairs" — Teamwork, Altruism, Progress and Stewardship — that were characteristic of our founders.